desiccated coconut | Some More Please! My friend Emily and I often have movie days and for today I asked her if she wanted me to bake her anything. She requested “Raspberry and Coconut Slice”. This is an old fashioned favourite and very easy to put together. 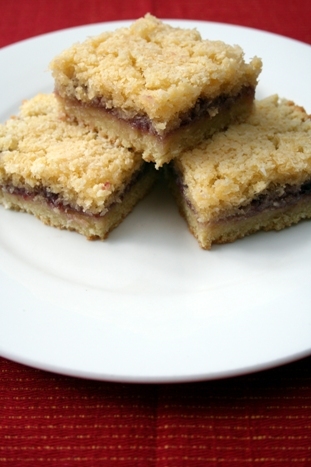 It consists of a sweet biscuit-like base, a layer of raspberry jam and finished with a sweet coconut topping. To be perfectly honest, this is a slice that has apparently eluded me for my entire life! I had never had it before today and it was really nice. I am already thinking of some variations; blueberry jam instead of raspberry served with whipped cream. Yum. Combine flour, sugar and butter in a food processor and pulse until the mixture resembles fine breadcrumbs. I actually used my hands for this, as our food processor isn’t quite big enough. Add the egg and combine until the mixture forms a ball. Line a 3cm deep 18 x 28cm slab pan with baking paper. Press the base mixture into the pan and bake for 10 minutes or until it begins to brown. To make the topping; whisk together the coconut, sugar and eggs until well combined. Spread the jam onto the warm base, microwave for a few seconds to make it easier to spread. Next spoon on the topping and using the back of the spoon gently press making sure it is all even. Bake for 20 minutes or until the top is golden and the base is cooked.